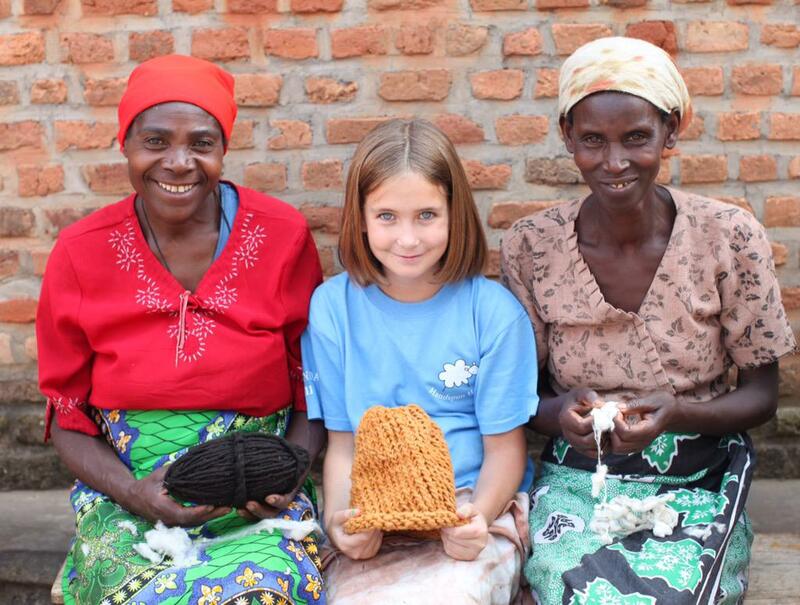 KidKnits buys yarn from women in Rwanda and Chile, through local nonprofits who are helping these women develop skills and earn an income. KidKnits then bundles the hand-spun yarn in a kit that includes a loom and simple instructions for making a hat. What was it like traveling to Rwanda and Chile and meeting these women for the first time? What did you learn? I went to Rwanda when I was ten, and I did not know what to expect. I had actually never been out of the United States. When I arrived, I found that everyone was so welcoming and kind. In Musanze, the town where the ladies live, there were not very many cars, paved roads, or skyscrapers. When I first met the women that work with KidKnits, they jumped up and down, screamed, and gave me lots and lots of hugs. It made me feel really special and it made me realize that even a small non-profit like KidKnits could really make a huge difference in the lives of people in developing countries. Ellie sharing her knitting techniques. The women that work with KidKnits have only the basic needs for life, yet they were so happy and joyful. They really taught me that no matter your situation, you can be happy with what you have because God will help you get through. Fabrice, one of the sons of the women, ate a raw potato for lunch once, but he was so grateful for what he was given. While I was in Rwanda, I became very close to the ladies and their kids, even though we didn’t speak the same language. They all acted just like my mom and that made me feel special. When I went to Chile, I experienced the same kind of friendliness and joy, but I also experienced a different kind of poverty. All of the women who work with KidKnits in Chile have the basic life essentials they need, which is unlike the women in Rwanda. However, school is not free after sixth grade, so many kids do not continue going to school. Most of the women use the money they make from KidKnits to pay for their children’s education. Different from Rwanda, where I met the ladies at their office, I got to meet the ladies in Chile at their homes. Many of their homes just have mud floors and one or two very small rooms. Yet, when we visited them, they gladly welcomed us into their homes and even gave us cookies! One of the daughters of the women was my age, and her biggest dream was to be able to have her own room, and to not have to share a bed and room with her two younger brothers. That really made me stop and think about my own life. I had fun playing soccer with the children at one of the small country schools near where the women who work with KidKnits live. The entire school joined in a soccer game with my sisters and I when we brought them a new soccer ball. I learned that the entire school didn’t have a ball to use so it was very special for them all to join in the game with a reaI ball. I think it is very interesting that just a soccer ball can be so fun for Fabrice in Rwanda, the kids in Chile, and my sisters and me in America. I think that what is interesting about both Rwanda and Chile is that the people there are really just like you and me. They don’t live in the same way or speak in the same way, but they still like to laugh and hug and have fun. I learned that we could all do that together no matter what language we spoke. What has working with Kid Knits taught you? Has it influenced what you want to be or do when you get older? KidKnits has taught me that “the other side of the world” can be very far away or it can just be in your own town. I have traveled to different countries, but I have also traveled across my town to different neighborhoods where kids are very different than me. I have gone to these different schools to teach kids how to knit hats and I have realized that, just like kids in Rwanda and Chile, kids on the other side of my town may look or live different than me, but they are really quite the same. They have just as much fun knitting as I do and they like to laugh and smile just like me. I have also learned to think less about just my family, my friends, and myself. Rather, I have learned to think about the world – everyone, including the people I don’t know. I know that right now there are kids having to get up and work all day instead of going to school and that doesn’t seem right especially when I know that they are just kids like me. After traveling around the world with KidKnits, I have learned that I enjoy experiencing and learning about the different cultures in the world. One time, when I was in Rwanda, I got to try to balance a bucket on my head like they do to carry water. The women and I had a really fun time laughing and creating memories together while I tried something from their culture. When I grow up, I want to be an international business person because I have seen how much having even a small job can help families in poverty. What advice do you have for other kids who want to make a difference in the world but don’t know how? If you want to make a difference the world, start by looking at what you enjoy doing, like I enjoy knitting. Then, using what you enjoy, think about how it can help others. I just had an idea of using a special kind of yarn from Rwanda and Chile to do what I already enjoyed doing. I also think it’s important to know that even if you help someone in your city or neighborhood, you are helping to change the world. The most important thing that you need to remember when you are making a difference in the world is that you should never give up. Keep trying and you will find that even small ideas, like knitting, can really help to change a life. Want more ways to make a difference for girls and women around the world? Visit ONE Girls and Women now!